Our Manchester team works in partnership with a large number of mainstream and special educational needs and disabilities (SEND) schools throughout the region. The office is well stablished and is home to a dedicated team of experienced consultants and administrative staff. 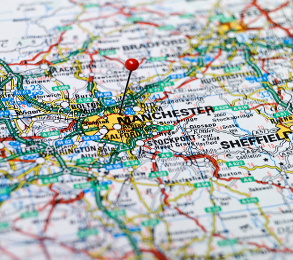 Whether you are looking for work, or seeking help recruiting staff, the Manchester team are bound to be able to assist. Candidates - register now to work for Axcis Manchester office. City Tower is right at the heart of the city. Just a 5 minute walk from Manchester Piccadilly train station and with the Metrolink tram and Piccadilly Gardens bus interchange on the doorstep. The nearest carpark is NCP Piccadilly Gardens ( M1 3AY). From Manchester Piccadilly station, exit via the main entrance and turn right. Walk down the hill and after 5 mins you reach Piccadilly Gardens. Walk through the gardens and when you reach the middle look left and you will see City Tower on the left hand side behind the bus stops.